We had a very successful spring conference in my home state of Florida as a joint meeting with the American Academy of Pediatrics (AAP) Section on Osteopathic Pediatricians (SOOPe). In October, we will have an outstanding program at the OMED 2018 Conference in San Diego. Please make every effort to attend. 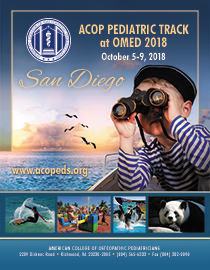 The ACOP program at OMED will have several nationally recognized speakers and sessions in pediatric osteopathic practices. I attended the annual American Osteopathic Association’s House of Delegates meeting in Chicago last month. Several important items were discussed and voted upon that will impact the future of our profession. Two items that were of particular concern for our professional college involved the future structure of the AOA’s Bureau of Osteopathic Specialists and the shared income the colleges receive from the annual OMED event. I am happy to report that we were successful in our lobbying efforts on both of these issues. The Bureau of Osteopathic Specialists was to limit its membership to only the larger specialties in our organization. That proposal was defeated, and all of the smaller colleges will have executive board membership on a rotating basis. The other proposal that was successfully adopted will increase the portion that each college receives from the registration paid for attendance at the annual OMED event. This will directly help our college to gain some added income from the conference, and will encourage other colleges to consider participating in OMED. Our college’s Graduate Medical Education Committee has had another very successful year. We have successfully moved practically all of our AOA accredited programs to ACGME accreditation. This process went smoothly due to the foresight of the committee under former chair Dr. Robert Hostoffer’s leadership. Several years ago, the Committee updated the residency standards to include most of the requirements to achieve ACGME recognition. This modernization of our standards allowed our programs to already have most of the components in place to seamlessly transition to the new requirements. The committee is now working on actively creating pediatric residencies that have osteopathic recognition with specific osteopathic pediatric training. They have formed a task force to work on helping programs to achieve this distinction which will include an online toolkit with detailed instructions and support files. We have two programs that have achieved this designation, and several more programs (including programs that were not AOA accredited) that are working on reaching this designation. Our American College of Osteopathic Pediatricians is here to serve you, but our success depends on the work of so many of our members. If you are not a member of one of our many committees that are the core of our success, please consider joining one as a participating member. The gratification you will get from helping our college and the lifelong friends you will make in the process, are so worthwhile on both a personal and professional level. Lastly, I am announcing that I am retiring from my position as Chair of Pediatrics at Nova Southeastern University and moving to North Carolina. 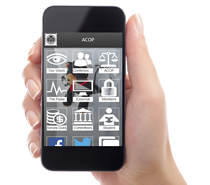 This does not end my involvement with the ACOP. I actually will now have more time to devote to the important needs of our professional college. 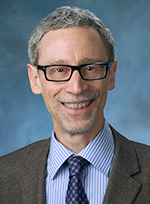 I do intend to continue to be involved in pediatric healthcare in my new location, but I am looking forward to having more time for family and personal interests.